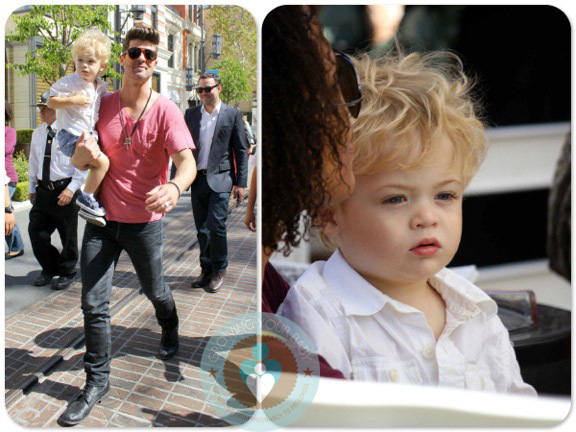 Singer Robin Thicke spent some daddy time with his son Julian at the Grove in Los Angeles before filming Extra with Mario Lopez on Wednesday. The singer, who currently co-stars alongside Kelly Clarkson, Jennifer Nettles and John Legend on Duets, may be partnering on a song with his 2-year-old son, or wife, actress Paula Patton. Robin says they can both sing. A few years ago Paula sang a small part on a song he produced for Usher, “Can U Handle It,” and Julian, he believes, may have some promise as well! The tot is also getting some first hand experience while he hangs out with his dad on set on “Duets”.